Find your best way to our hotel in Luckenwalde. Please enter at least your starting city with zip-code. From Highway A 10 take exit Ludwigsfelde Ost (federal highway B 101) off the southern ring of Berlin direction Luckenwalde passing Trebbin. through B 101 up to the exit Woltersdorf / Nuthe Urstromtal. In Luckenwalde, follow the main street and turn right at the traffic light in to "Beelitzer Straße". After some 300 m turn left into street "Puschkinstraße". At the 5th corner Puschkinstraße / Goethestraße you will find our hotel. From Highway A 2 merge to highway A 10 towards Frankfurt/Oder and take exit towards Leipzig (highway A 9). At the first exit (Beelitz Heilstätten, Fichtenwalde) leave the highway and drive towards Beelitz. In Beelitz keep on straight after the traffic light towards Zauchwitz. At the roundabout take first exit. You are driving now through the following villages Rieben > Dobbrikow > Hennickendorf > Berkenbrück which will take you to Luckenwalde. In Luckenwalde keep on straight until the intersection of the street "Puschkinstraße" and then make a right. Drive on until the street "Goethestraße" (5th street to the right). Our hotel is there. From Highway A 9 you you take exit Niemegk towards Niemegk and Treuenbrietzen. On federal highway B 2 towards Potsdam make a right towards Luckenwalde (before entering the village Buchholz). You are driving now through the villages of Kemnitz > Zülichendorf > Frankenförde > Frankenfelde that will take you to Luckenwalde. 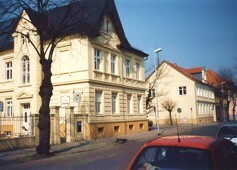 In Luckenwalde, make a right immediately after the railway bridge into the street "Bahnhofsstraße". Drive up to the train station and turn left into the street "Goethestraße". After about 200 m you can see our hotel on the right hand side at the corner of Goethestraße / Puschkinstraße. You can reach us by train from the train station Luckenwalde (Bahnhof), only 200 m away from our hotel (see map).